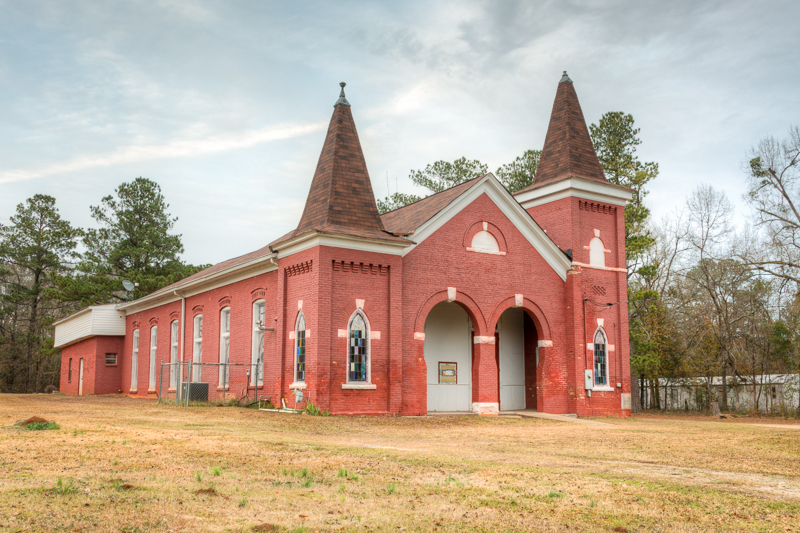 We have conflicting information about the origin of St. Marks AME but it was one of the earliest African American churches in Hancock County that was started after emancipation in the late 1860’s and early 1870’s. 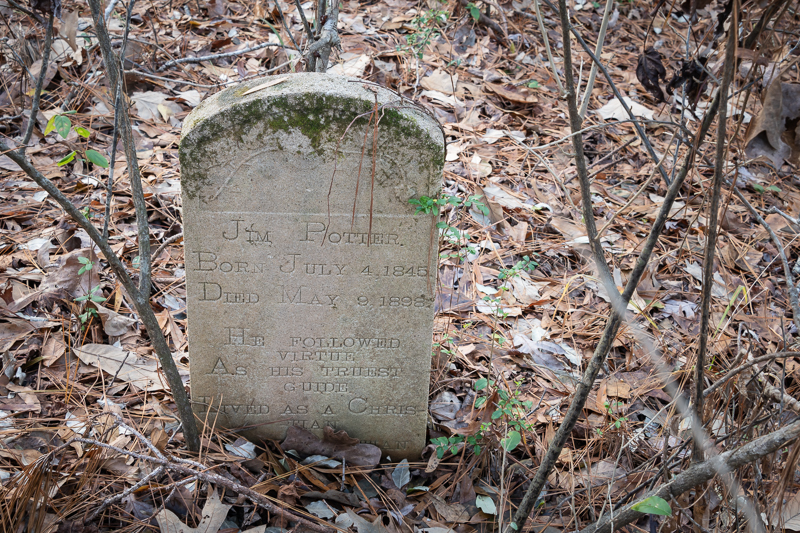 The Land Between by Forrest Shivers tells us that St. Marks was one of the earliest AME churches in the county and that “St. 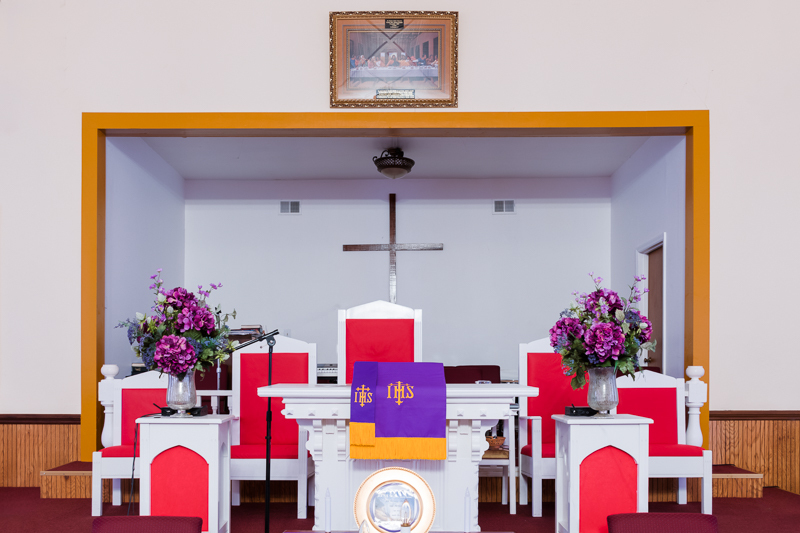 Mark’s early became a center of black religious and social life……..A camp meeting at the church in 1874 was reported to have attracted seven railway cars of worshipers from Augusta and another ten from Washington, Wilkes and points north. Three thousand people were said to have been on the grounds for the services”. We found a construction assessment of the church stating the church you see here was completed in 1901, however the Shivers history states that that “The present house of worship dates from 1892 when the pastor, the Rev. W. M. Duncan laid the cornerstone in the presence of Bishop Grant and other church notables”. This was reported by the Sparta Ishmaelite on July 29, 1892. 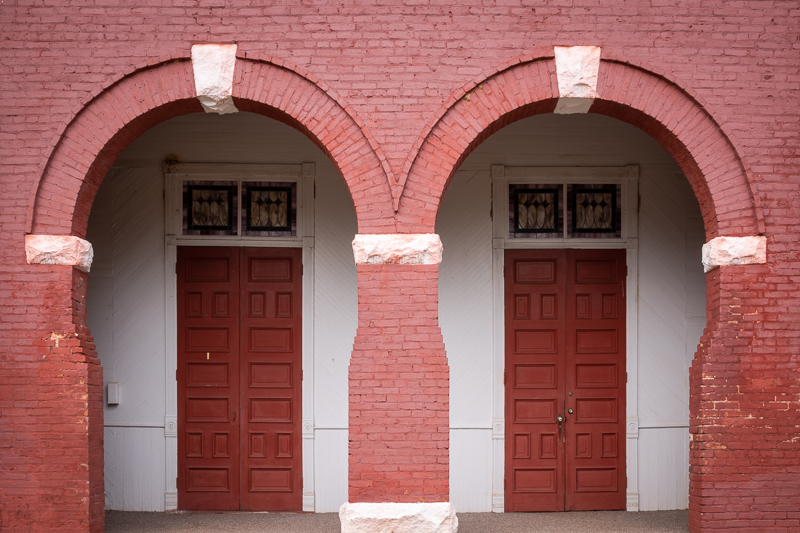 Either way, St. Mark’s has a proud history dating back to the end of the Civil War. 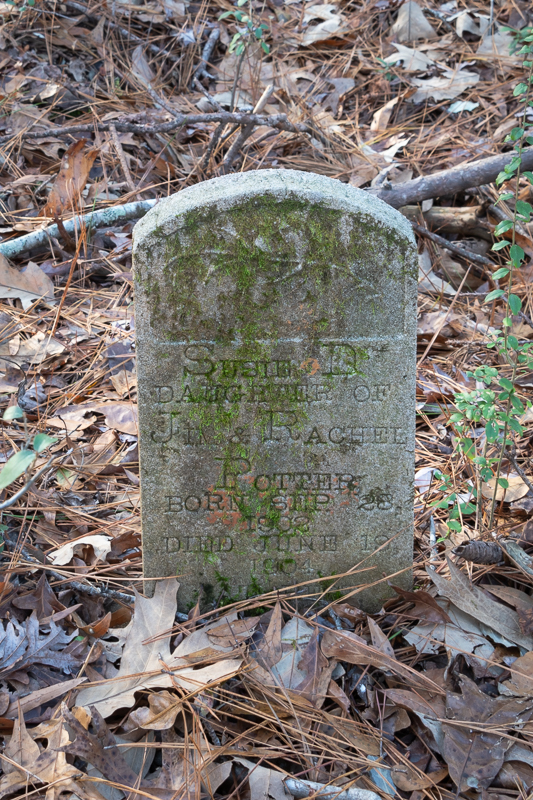 The cemetery, we are told, has over 200 unmarked graves and many of these people, in either marked or unmarked graves, were born into slavery. St. Marks would be the center of their lives for generations to come. The little community of Dixie was a vibrant one and furnished more than a few veterans who helped fight our country’s wars. We think it is important to remember them. The following commentary on St. Marks was compiled by John Kirkland, who is one of HRCGA’s outstanding photographers. “Sparta, Hancock County, Georgia was founded in 1795 and designated as the county seat in 1797. Over the last two decades as Georgia’s population has grown, Sparta’s population has decreased. One thing that has not diminished is St. Mark’s A.M.E. church. 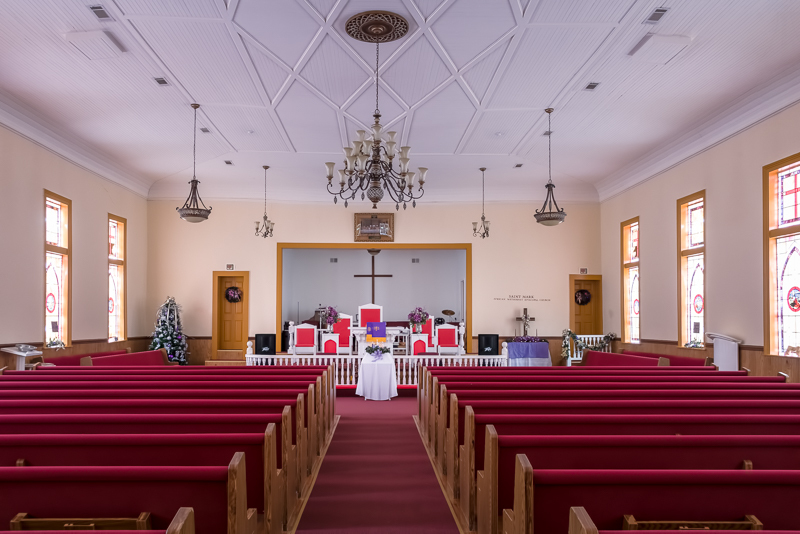 This historical church was founded in 1867 and it is still one of six active African Methodist Episcopal churches in Sparta. St. Mark A.M.E. Church is located just off of Highway 22 on James Hunt Jr. Ave/St Mark Church Rd. Though the church is now located in a somewhat residential area but you can tell it was once clearly part of a rural setting. The original part of the existing church building was completed in 1901. The one and a half story, mostly brick structure with its two towers resembles many of the churches of that time period but also incorporates many Romanesque and Gothic Revival elements. The building has two separate entrances in the front consisting of two extremely tall paneled double doors that are reached by passing through two Romanesque arches. They give you a good hint of the craftsmanship and beauty that is located beyond them…original wood, stained glass windows (depicting a Poor Man’s Bible) and a tongue and grove ceiling patterned in a lozenge (a diamond or crisscross) design. One document I read also mentioned signs of a fire existing in the attic but goes on to talk about the “ingenious system” of cambered/scissor trusses used for the ceiling and roof and states that the “complexity and endurance are testaments to the skills of the church’s builders”. Endurance is probably a good choice of words…St Mark’s A.M.E. has stood and served the community for many years! We are pleased to be able to present you in this photograph with a close up of the two large Romanesque entryway columns and a chance to see the high quality brickwork of the church builders. In photo one, we mentioned the inset panels and their brick corbelling along the top the insets. In this photo, we see that the same brick corbelling technique used in the insets was used to gently taper these supporting brick columns. We also get a better look at the rusticated stone used to make the transfer to the Romanesque arches. This is some fine workmanship. This beautiful Lancet window, one of two adorning the face of Saint Marks, is a Gothic element and proof of its eclectic design style. The fact that these windows remain in their original position and frames is remarkable. Again, we see the very effective use of rusticated stone to highlight this attractive feature. Who was making these decisions and executing the many attractive design features at Saint Marks? We do not know at this point, but, we hope to learn more in the future. Here we see one of the very tall, main entry doors. They both are solid wood, multi-paneled and sit in their original wooden frames. 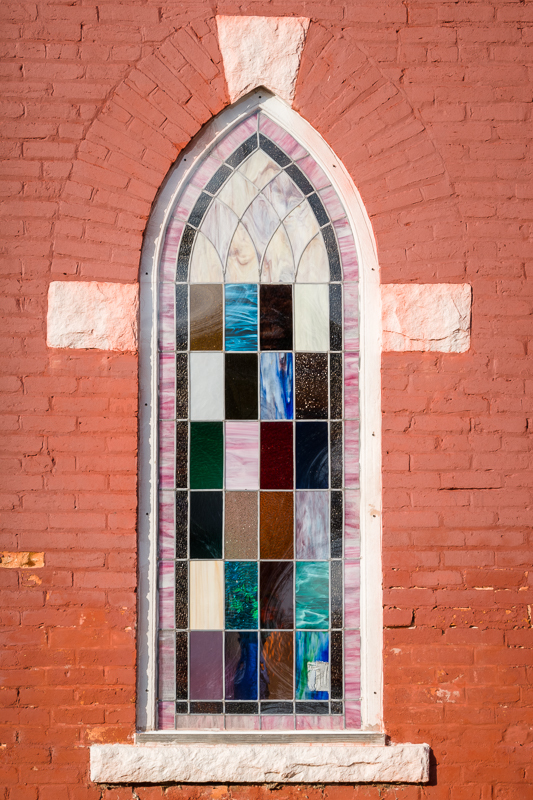 The stained glass transoms provide a particularly attractive design feature. 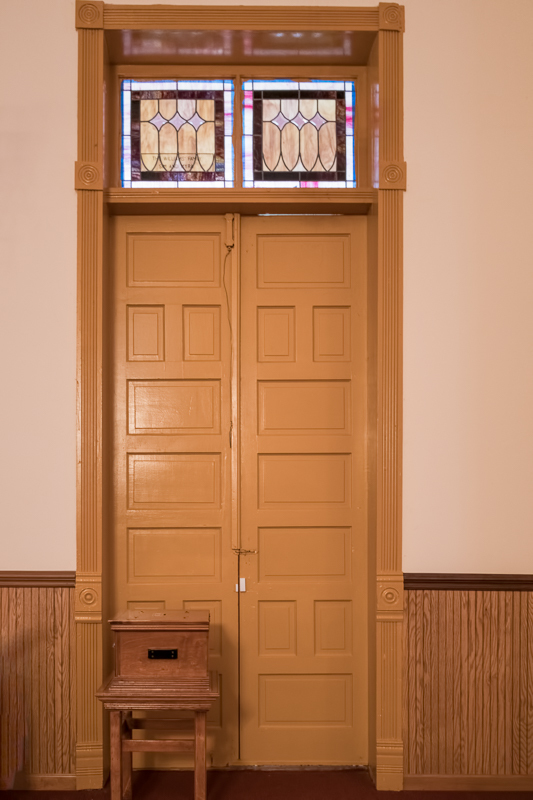 In this view, we also get a close look at the chair rail and wooden wainscot that is featured throughout the sanctuary. The sanctuary at Saint Marks reflects the eclectic style seen in its exterior’s design. From the rear of the church we are looking toward the chancel, pulpit and apse. 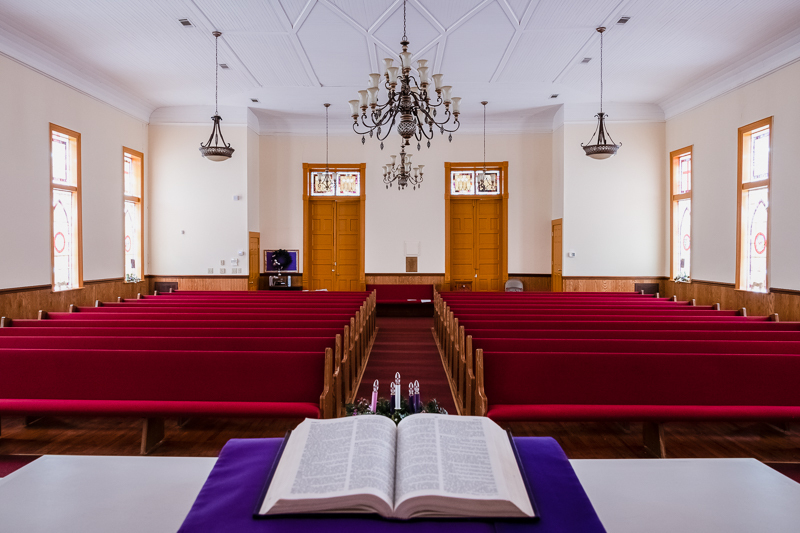 We see before us a magnificent house of worship whose tall windows, high ceilings, bold, wide, elaborate ceiling molding, stately pews and unique ceiling treatment and design are seldom found in early AME churches. Here we have a view of the chancel, pulpit, apse and proscenium. It is not elaborate but is quite attractive and practical. 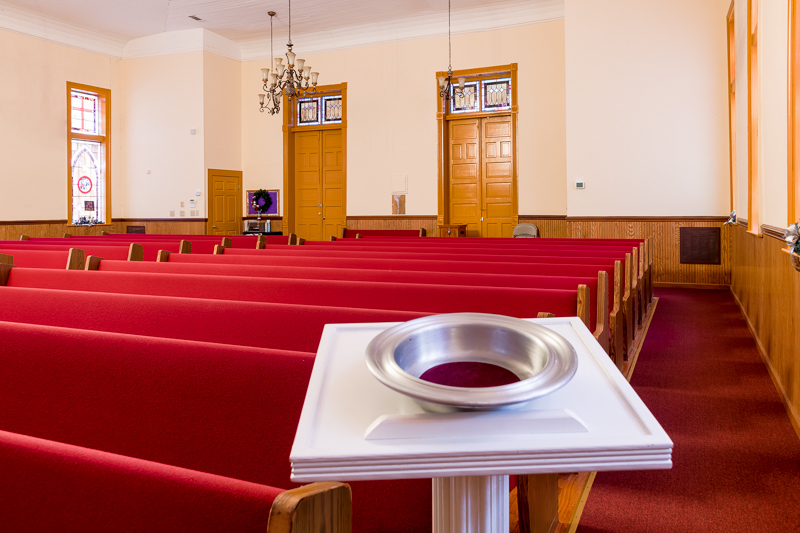 Regular services and special events reflect the active nature of this church and its congregation. Here we are getting the chance to really look closely at, and be marveled by, the unique ceiling treatment within this AME sanctuary. Tongue and groove boards are artistically placed in panels and patterned in a lozenge, diamond or crisscross design. Perhaps this a ceiling treatment seen in other rural Georgia churches, but it is unseen and unknown to our HRCGA team. We hope to be able to learn more about this treatment as we question the Pastor and parishioners at the church. This is a view of the sanctuary illuminated only by ambient light from its many large and lovely windows. Their stained glass transoms help add a warm and lovely glow within. 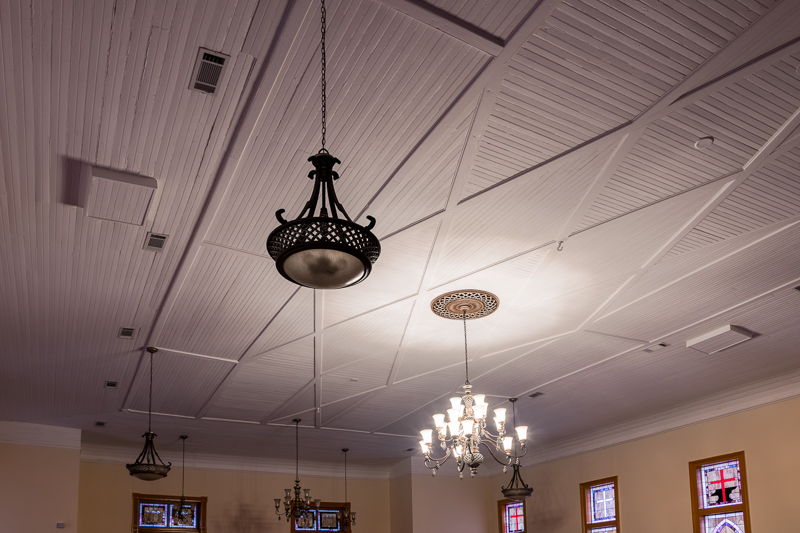 Here the unique ceiling treatment can be seen along with the lovely formal chandeliers, the Victorian lighting fixtures, stained glass windows, pews and other decorative elements found in this special church. This eclectic mix of interior design and architecture is the hallmark of Saint Marks. 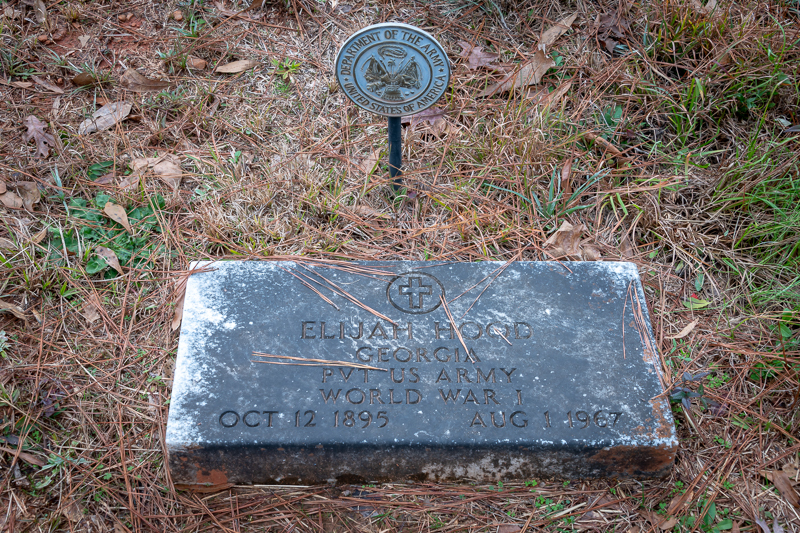 Elijah Hood was born October 12, 1895. He entered service August 4, 1918 and served as a PVT with the 342 Serv BN during World War I. He was overseas from September 30, 1918 to July 24, 1919. He was honorably discharged August 1, 1919. The 1930 census shows him with his wife and seven children. He is shown as working in a quarry. Jim Potter was born July 4, 1845 and died May 9, 1898. The 1880 census gives his place of birth as Virginia. He almost certainly was born a slave, and likely sold into Georgia by a slave trader. Importation of slaves from Africa had been banned in 1808. Thus the rise of King Cotton prior to the Civil War required a very large re-allocation of slaves from north to south and many families were broken up. His parents are also shown as born in Virginia but we do not know whether they were enslaved in Georgia or not. In 1880 Jim was working as a laborer and his wife Lou Bertie Chandler Potter was working as a servant. He could not read or write. Their children are Lucie, Charley, Jimmie and a new born not yet named. We think Susie Potter who died at the age of two was probably Jim Potter's granddaughter. Jim is featured in the previous photo. Infant mortality was a frequent occurrence in the late 19th and early 20th century. Little Susie was obviously loved very much and she was given a sweet and appropriate head stone, that was very similar to her grandfather's. Both would have been purchased either from a local source or perhaps Sears and Roebuck. 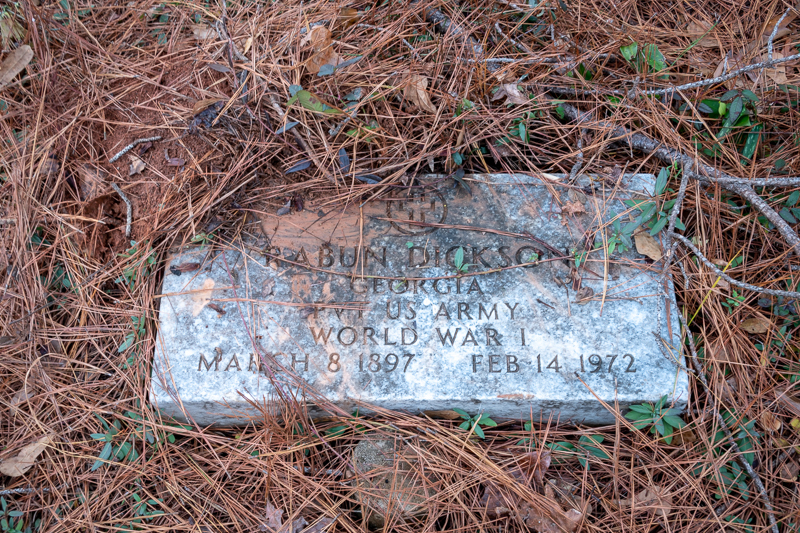 Rabon Dickson was born March 8, 1897. He was inducted into service August 22, 1918. He served in the 157 Dep Brig to August 29, 1918. He then served in Company B, 315 Serv until his discharge. He served as a PVT and was overseas from August 23, 1918 until June 23, 1919. He was honorably discharged June 28, 1919. The 1940 Hancock County census shows him living with his wife and six children. He owned his own home and worked as a laborer on roads. He died February 14, 1972. Leroy Sherman Wiley was born October 10, 1936. He served as a Sergeant in the United States Army and was in the National Guard for twenty years. According to the findagrave website he received a Bachelor of Science degree from Fort Valley State College and a Masters degree from Georgia College and State University. He was elected Superior Court Judge for Hancock County and served in that position for 41 years. He also served as EMA Director for many years. He died December 11, 2011. 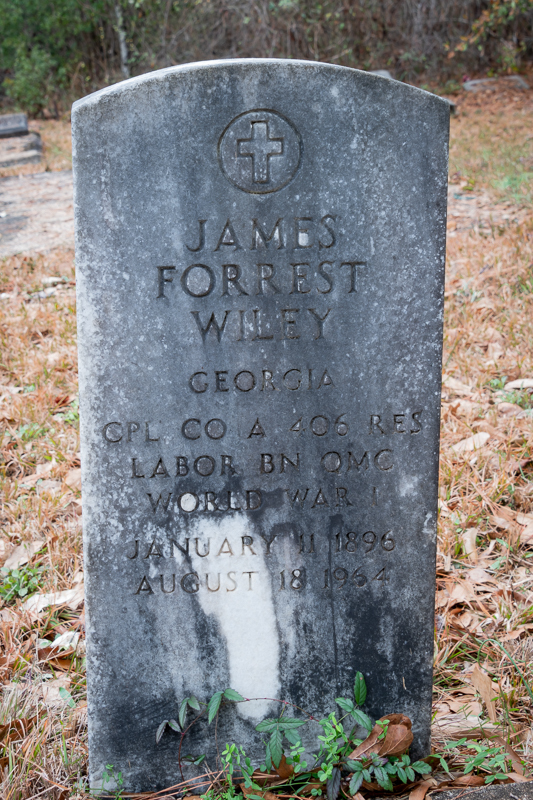 His parents James Forest Wiley and Annie L. Wiley are also buried at St. Mark AME Church Cemetery. James represents the new economic class of African Americans who managed to get educated and live a life of accomplishment. Many chose to join the great migration to the industrial north but James chose to stay and serve his country and community. Thank you for your service. Please help us spread the word and increase our awareness of these old treasures. With your help and support, we can save these critical monuments to our past.